We're excited that you're interested in Woodbelly's catering or drop-off services. Once we have a bit more information about your event, we will prepare a detailed proposal for you to review. We can tweak or modify details as needed. Detailed policies are included on the proposal. We know how important prompt and efficient communication is for reducing stress and confusion. Whether by phone, email, or text, we are available to answer your questions. With nearly 10 years in the event business, we know many of the vendors in Northern Vermont and can help you execute your vision, ask the right questions, and be prepared for contingencies (including weather). Just ask our past clients. 1. Complete online inquiry form. We try to respond within 24 hours. 2. Review our response carefully. Our informational packet includes relevant information related to different styles of service and action stations. 3. Share with us any details that are missing, so we can build a comprehensive proposal and set up a phone conversation. 4. In person, or by phone: Discuss your vision, get your questions answered, and build a rough timeline. 5. Receive proposal and review with other decision makers before placing a deposit to reserve the oven. 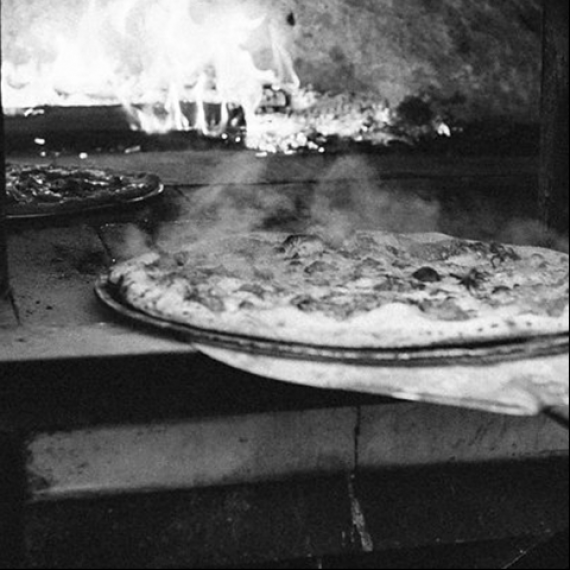 If you like the scope of our offerings, it is best to reserve the oven. We can modify the exact details of your event and menu at a later date. Remember, we do not take reservations without a deposit. $1000 food + beverage minimum for all events. $3500 food + beverage minimum for Saturdays in July, August, and September, as well as holiday weekends, and during foliage. Service, Tax, and Travel charged separately and based on the details of your event. Changes may result in additional charges. 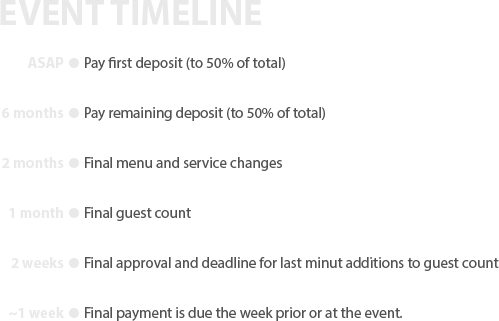 All Bar events require a credit card on file before the beginning of the event. We will process a charge or refund based on consumption the day following the event. 3% credit card processing fee charged on all credit/debit payments except for final beer and wine charges/refunds as noted above. We do not charge gratuity. We appreciate tips for a job well done (frequently $20—$60/staff person). Here's A Practical Wedding guide. Checks should be sent to 1320 Horn of the Moon Rd., Montpelier, VT 05602.